Bogong owner Neil Blundy has spent more than his fair share of days walking in the European Alps. 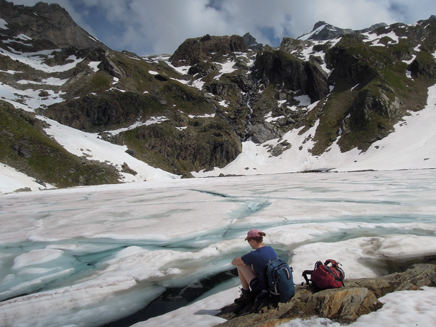 This is the first in a series of information blog posts about the Why, Where and How of hiking in the European Alps. I have hiked extensively across the European Alps and all countries are wonderful but the place with the strongest pull for me to return to is Austria. The mountain tops are lower than the giants of the Swiss and French Alps. This means for the mountain walker less extensive glaciation so hikers lacking in glacier travel skills have more routes to explore and can do so unencumbered by the necessity to carry technical equipment. The mountains are nevertheless dramatic with wonderful alpine landscapes. But more to the point Austria is a country with an extraordinary mountain hiking heritage developed over many years. Beautiful valleys link the mountain tops with picture postcard villages all of which offer wonderful places to stay due to the ingrained Austrian culture of hospitality. There is an extensive spider web of trails that crisscross the alps and connect a network of Mountain Huts. Much of this is maintained by the Austrian Alpine Club which has 320,000 members. These huts supply food and sleeping accommodation which frees the hiker from carrying large quantities of food, tents & sleeping bags meaning longer walks can be undertaken with a 35 to 40 litre pack. For a full discussion on the equipment needed see the blog Gear for Hut-to-hut walking in Europe. The huts are without a doubt what gives hiking in Austria the distinctive character that it has. There is no parallel to them in Australia. They are part hotel, part hostel. All offer a welcome haven to mountain walkers. You can find out much more about the huts in the blog Mountain Huts in Europe. The world is indeed your oyster in this walking paradise. So what are the best walks in Austria? My interest has always been in longer walks of say 4 to 7 days duration but the possibilities for daywalks or 2 to 3 days walks are just as extensive. The Silvretta, Otzal, Stubai, Hohe Tauern, Zillertal and Dachstein regions all offer fantastic hiking just to name a few. So how do you choose from this surfeit of riches? There are plenty of good English language guides to help along the way. Walking in Austria by Kev Reynolds (Cicerone), as the name would suggest, describes walks in all regions of Austria but the majority are daywalks. Multi day walks are suggested for most regions but with only basic descriptions. There are two specific guides to particular areas. These books are therefore lighter and thus better to take with you. So perhaps choose one of these and head off. 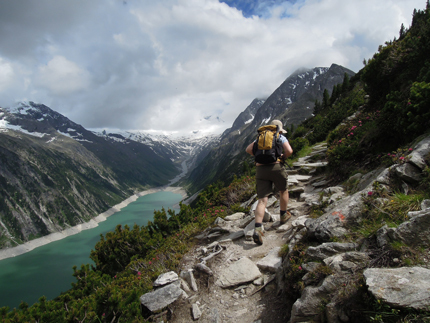 Trekking In The Zillertal Alps by Allan Hartley (Cicerone). Describes the 8/9 day Zillertal High route. This is a circular walk. Variations include the Berliner Hohenweg 3/4 days and various others which could cut the full 9 day trip to 6, 4 or 3 days depending on which valley you exit north from. Trekking in the Stubai Alps by Allan Hartley (Cicerone). Describes the 8 to 10 day Stubai Haute route and its many shorter variations. This extremely accessible area close to Innsbruck is deservedly popular but suffers somewhat from an overdevelopment of downhill skiing infrastructure. 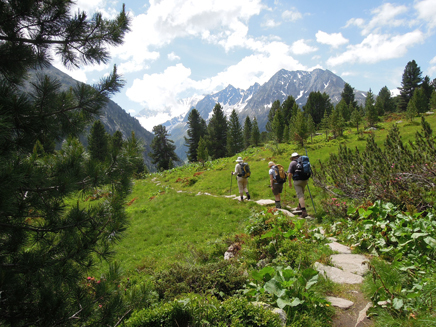 Also of interest are Walking in the Alps and Trekking in the Alps (Cicerone). Both are larger format productions with detailed descriptions of multiday walks across the European Alps, not just in Austria. To get you started might I suggest two walks. You simply cannot go past The Zillertal High Route for a wonderful high level circuit walk but this is for experienced fit bushwalkers only. The second suggestion in the Silvretta Alps is a much milder option with shorter days and time to soak up the Austrian walking experience at the huts. If you have a yen to be an aspiring mountaineer there are peaks to climb from this walk and mountain guides can be employed from Wiesbadner Hut to climb some of the big peaks in the region such as Piz Buin. 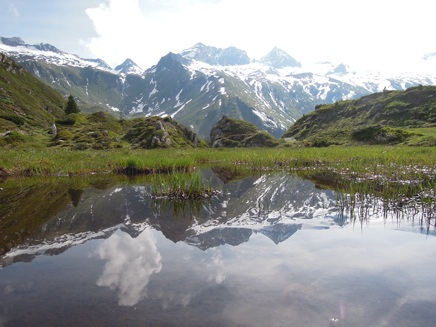 The Zillertal High Route is a wonderful mountain tour and is well covered in the English language guide. Allow plenty of time and try the whole circuit. It will be best to be very fit before you leave. For the adventurous there are plenty of peaks that can be bagged along the way and these are described in the guide but be aware whilst technical mountaineering skills may not be required a head for heights will be. There are many sections with a cable as a hand rail to help you along the way and you will gaze in awe at the routes you have traversed. 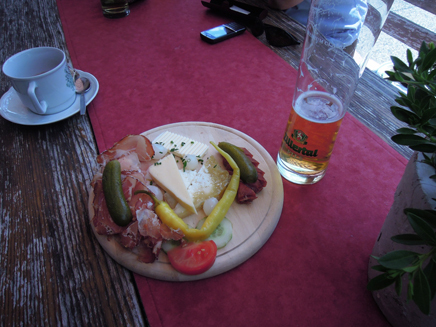 Some of the days are long and demanding but every night is spent in a wonderful mountain hut with a good meal. There are plenty of options to shorten this walk or opt out if caught in bad weather. The walk starts in the town of Mayrhofen which is easily accessible from Innsbruck or Munich by public transport. Among the many highlights are the 3,000m pass at Schönbichler Scharte with a short and easy diversion from the pass to the summit of the Schönbichler Horn at 3,134m. 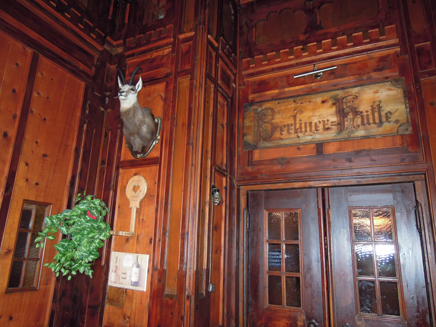 Enjoy the many atmospheric huts including perhaps the most atmospheric of all Berliner Hut, which reeks of history and is in a superb location. See a video shot at another hut on this circuit the Friesenberghaus here. This entire walk is covered by the 1:50,000 map Zillertaler Alpen. The Silvretta Alps left an indelible impression on my mind when I passed this way. Hopefully this was for better reasons than that I was laid low by illness at Heidelberger Hutte for a day. Try this 4 day walk. Both ends are accessable by public transport and this route is significantly less demanding than the Zillertal High route. 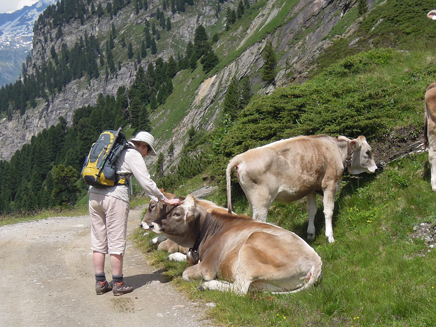 However there is plenty of fine trekking with views of high glaciated mountains and beautiful typical Austrian green valleys with contented cows along the way. 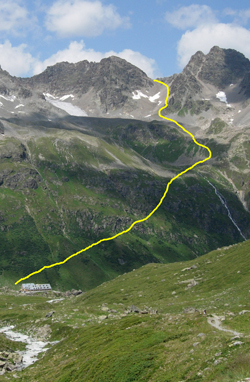 The entire walk is covered on the 1:50,000 map Silvretta Verwallgruppe. Regular bus access runs from Ischgl to Bielerhohe (~50 mins) and thus the walk can be completed as a circuit. There are no detailed English language notes in print that I know of but a brief overview is contained as part of a longer walk in Walking In Austria. What you really need is the Kompass map Silvretta Verwallgruppe which clearly shows the way. Here is a brief outline, which together with the map will be sufficient info for any experienced bushwalker. Day 1. This is a leisurely 1/2 day walk to access Wiesbadner Hut with wonderful views as you head up the valley towards the hut. There is plenty of time to travel from Ischgl to Bielerhohe by bus or indeed from further afield such as Innsbruck or even Munich if needed. The walk is a pleasant stroll of perhaps 2.5 hrs to Wiesbadner Hut, www.wiesbadener-huette.com around the east side of the lake Silvretta Stausee and up Ochsental valley to the hut. This route is on the access road to the hut but the road can be avoided by taking the hiking trail to the left which leaves about 500m south of the dam wall and contours around the mountainside to the hut. Either way you should have plenty of time to soak up the sensational view of the glaciers and high mountains from the hut terrace with a beer in hand. Day 2. Jamtal Hut www.jamtalhuette.at/english is reached via Rad Sattel and Getschnerscharte (both saddles or passes) in approx 5/6 solid hours of walking. An extremely worthwhile side trip is an ascent of Hohes Rad from Rad Sattel. This involves some low level scrambling skills. The return trip from Rad Sattel takes about 1.5 hrs. The descent from Getschnerscharte is steep and offers exhilarating views down to Jamtal Hut. Jamtal Hut is large, modern and very well appointed. It has showers! For the energetic a climb to the top of the Westliches Gamshorn may be in order but I have not actually climbed this peak. Day 3. A beautiful day's walk of perhaps 6 hrs following route 302 to Heidelberger Hut via the Kronenjoch. 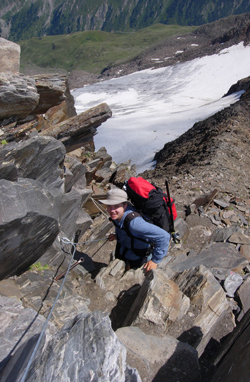 This pass is not difficult by Austrian standards and the tiny rump of a glacier shown on the map requires no special equipment or particular hazards. After an initial very rocky section it is a wonderful walk down the valley from the Kronenjoch to the Heidelberger Hut with fine mountain views. http://www.heidelberger-huette.at/. Day 4. An easy walk of some 3.5 hrs down the valley to Ischgl following the access road up to the hut. NB: Since writing this blog a new guide book Trekking In The Silvretta and Ratikon Alps has been published. It describes in detail the first 2 days of this walk. Unlike in Australia mountain search and rescue in Austria and indeed in most of continental Europe is not a free service. Whilst S&R is incredibly skilled and efficient if you need to be choppered off some mountain with a broken ankle you can expect a sizeable bill. Check your travel insurance policy carefully to see if it will cover such eventualities. Be warned many do not. Better still join the Austrian Alpine Club. Apart from giving you a discount at mountain huts membership includes worldwide mountain rescue insurance and is thus a bargain really. English speakers may find it the most user friendly to join the Austrian Alpine Club UK section. Full details of benefits are at their website. Austrian Alpine Club. In German but google will translate it for you. Has a list of all huts with links to the hut website. Zillertal Alps Tourist Site. Has a wealth of information on this area centred on the town of Mayrhofen. 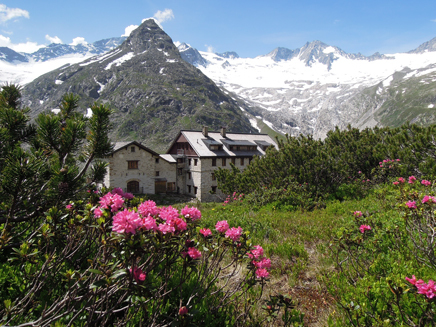 Hohe Tauern National Park site. The cows are very friendly.